Pau Gasol survived yet another season where the Lakers didn’t trade him, but uncertainties still remain. Those go beyond Gasol’s health after spending this offseason recovering from a knee procedure that entailed reducing the pain in his tendons. After the nixed Chris Paul deal two years ago opened up a floodgate of Gasol offers that the Lakers have rejected, will they want to keep him once his $19 million contract expires after this season? Not that it’s surprising. 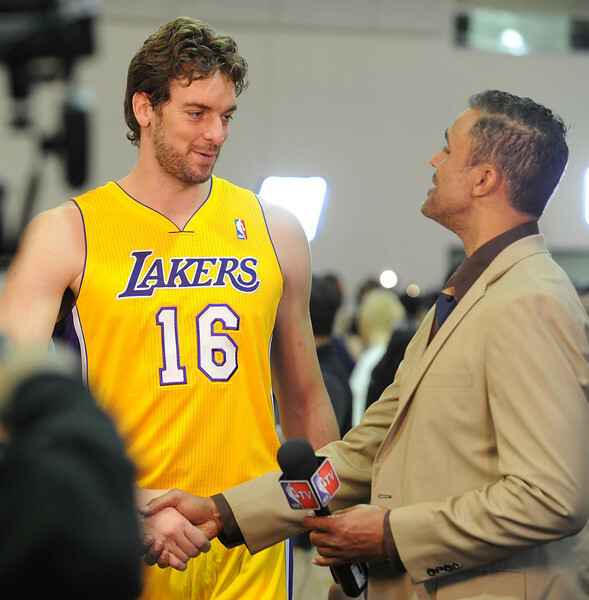 But Gasol admitted that the Lakers haven’t begun any formal talks with his agent, Arn Tellum, on a possible extension. The Lakers haven’t started negotiating either with Kobe Bryant’s representatives despite the Lakers’ star having one year left on his contract worth $30.45 million. Lakers general manager Mitch Kupchak conceded the delay partly reflects a mutual logic that Bryant’s value will have more clarity once they see how he performs once he fully heals from his surgically repaired left tendon. As for Gasol, Kupchak envisions him earning his fifth NBA All-Star appearance because of improved health and Dwight Howard’s departure will give the Lakers forward a larger role. Last season, Gasol played mostly as a facilitator and missed a combined 33 games because of various ailments, two factors that played into averaging a career-low 13.7 points on 46.6 percent shooting. It’s likely Gasol would have to take a relative paycut because of the Lakers’ hope to retain financial flexibility to attract possible big-name free agents, including LeBron James and Carmelo Anthony. But the Lakers have more resources after Howard passed up a five-year offer worth $118 million to play with them. Before his departure, the Lakers put up billboards around various Los Angeles landmarks pleading him to stay. At the time, Gasol jokingly told the Spanish media he hopes the Lakers would unveil a similar campaign for him. Instead, Gasol simply needs to play the same way that helped the Lakers to two NBA titles and three consecutive NBA Finals appearances. Otherwise, this might mark his last season with the Lakers. Then again, many predicted the same thing regarding Gasol’s fate the last two years.